Best Instant Coffee: Ultimate Guide to Beans, Brands and Brewing Tips | EnjoyJava! EnjoyJava! helps coffee lovers make the best cuppa coffee and find the best gear – saving countless hours of research. When you use our affiliate links, we earn a commission. Here’s more about how we work. If you're going to drink instant coffee, you probably want the best instant coffee out there, right? I'm with you, and this post is devoted to everything instant coffee, the best brands, tips for making a good cup, things to consider when choosing, and what you need to know about how they make the stuff. Instant Coffee: What is it? How is it Made? Instant coffee has been around for a long time. According to The World Atlas of Coffee it was invented by David Strang in 1890, but it's come a long way since then. You may remember your parents drinking it early in the morning before leaving for work, but if you're from North America (and under 40) you probably haven't had much of it yourself. 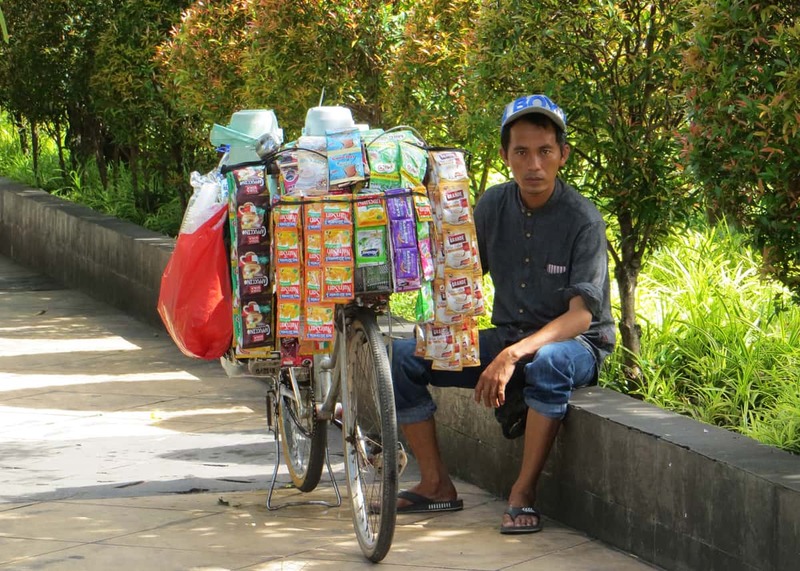 If you're from another part of the world, like South America, the UK, Indonesia or Japan you've probably had lots of great instant coffee and may just want to find the best instant coffee available. I hope to help with that. Did you know that almost half the world prefers instant coffee, with Australia and New Zealand leading that trend where over 75 percent of retail brewed coffee is consumed as instant? Many North Americans have gotten away from instant coffee in the past 40 or so years because brewed coffee has been so much better than instant. But as you've probably heard, there have been some improvements in the flavor and production of instant coffee that have us taking a second look. Why? Because it's sooo quick/convenient – and brands have improved the flavor. If you don't have a coffee maker or are running late a quality cup of instant coffee is just what's needed, or if you're planning a camping trip instant is way easier to pack and prepare, it's also great as an iced coffee, and a great flavor boost in recipes. But will even the best instant coffee taste like your fresh brewed favorite? That may depend on how “into” coffee you are. If you are used to measuring out your fresh roasted beans, then grinding them in your burr grinder and brewing them with your Chemex or stovetop espresso maker – then maybe not. But if you fit that description could some of the quality instant coffee on the market surprise you? Perhaps, you'll need to be the judge. But what is instant coffee, and how do they make it? What is instant coffee? Instant coffee is a concentrated, dry form of brewed coffee. It may be in the form of a fine powder or look more like little crystals or granules. The powder/granules dissolve easily in water. Adding water to instant coffee is the quickest easiest way to make a cup of regular or iced coffee. Spray drying involves high temperatures whereas freeze drying does not. Spray drying is a less expensive way to produce instant coffee and is also regarded as an inferior method. This seems to make sense to me because even when brewing coffee at home it's important to be careful not to use water that's too hot (around 205 F (96 C) is best) because it results in a more bitter flavored coffee. With spray drying the temp reaches to around 480 F (248 C). 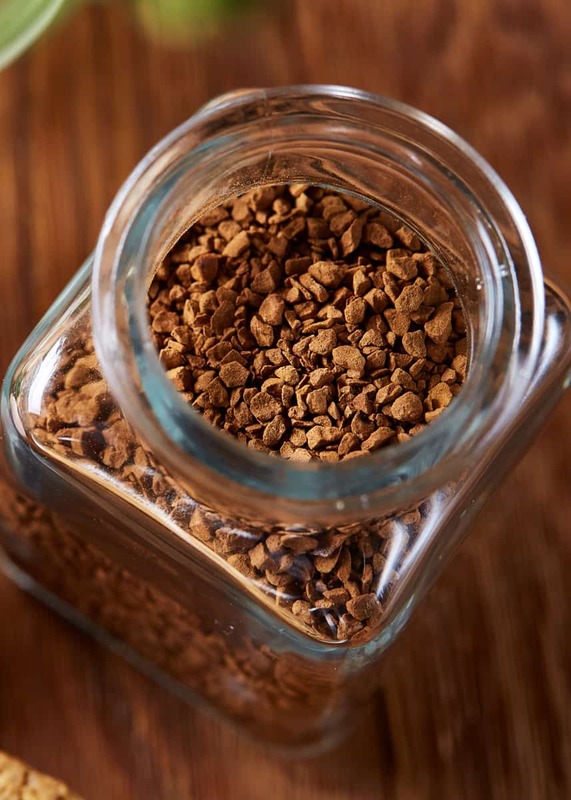 Freeze drying is a more expensive process and is said to produce a higher quality, more flavorful instant coffee. Helpful tip: When looking for the best instant coffee, try to find a brand that uses the freeze drying process. This should be noted on the label, if not look for one that does. Before the spray or freeze drying takes place the coffee beans are roasted as they would be normally, that's why you can buy instant coffee with different degrees of roast – light medium or dark. More reading: How long does coffee last? Does coffee go bad? When we look into how instant coffee is made, we may start to wonder if instant coffee is bad for our health. Instant coffee is no worse for your health than regular coffee. In fact, it has most of the same benefits (nutrients, antioxidants…) which makes sense because as mentioned above it's just a dry concentrated form of normal brewed coffee. The difference may be in the caffeine content. Instant coffee is said to contain less caffeine than coffee you brew yourself. But this can depend on how it is produced, how long the beans were roasted, what kind of beans were used, how strong you make it – and so on. So while drinking instant coffee may reduce your caffeine intake, I wouldn't put too much weight on that unless you investigate the brand and process yourself. A place to start would be looking for dark roasted, 100% Arabica beans because they will naturally have less caffeine than a light roast, or Robusta beans. With that being said it's always best to take a close look at the ingredients list. If you see a lot of added ingredients, then that's going to have a role to play in if your instant coffee is bad for your health. The more you know about what's in there the better, so try to find the purest product. If you're looking at decaffeinated instant coffee than you also need to be concerned about the way the coffee has been decaffeinated. Some methods use harsh chemicals. I'll talk more about what you should look for in instant decaf later on in the post. Helpful tip: If you've got digestive issues or food allergies traveling can be tricky (I know, I've got IBS) and sometimes little things can make a difference. 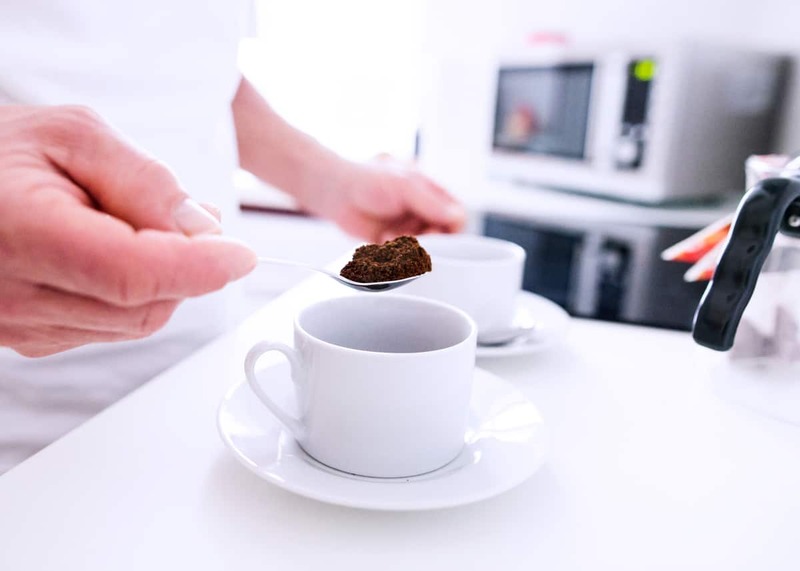 Packing some good quality pure instant coffee could help you avoid problems, especially if you're unsure of the ingredients of the coffee being served at your hotel. It would be best to sort this out before you travel by testing an instant coffee brand to make sure it doesn't cause you any problems. That way you could still enjoy coffee during your travels without worrying about allergies or digestive upset. Sudden Coffee – claims to have no chemicals or additives, just pure coffee. These both come in single serving packets which are great for travel. But, when it comes to your health it's always best to contact companies directly to make sure of ingredients. Now that we've looked at what it is and how it's made let's find out how to get the best quality instant coffee. We'll talk about the beans, the brands, and some brewing tips. If you find that you always notice that “instant” flavor when you drink instant coffee you may find the brewing tips particularly helpful. When talking about how to make good instant coffee we have to start by looking at the beans. Arabica is the most popular (making up 60% of world production) because the majority of coffee lovers prefer it's sweet flavor notes which include, chocolate, nuts, fruit, and caramel. Robusta comes in second (making up 40% of world production) with earthy/bitter flavor notes of smoke, pepper, and what many describe as rubbery. Now that we know more about the coffee beans let's see what difference this makes in getting the best quality instant coffee. The vast majority of coffee lovers agree that Arabica beans taste better than Robusta. In the past, instant coffee was often made from or included low-quality Robusta beans because they are cheaper. The problem with Robusta is that it produces a harsh, bitter flavored coffee. And this may be one of the reasons that instant coffee has had a bad reputation. But things have changed because some brands are now using 100% Arabica beans. A 100% Arabica instant coffee will almost always taste better than a mix of Arabica and Robusta. It may also cost slightly more because good quality Arabica beans cost more than Robusta beans. With that in mind, this may be one of those times that price does reflect the quality and an instant coffee with a bit of a higher price tag may be another thing to look for in finding the best instant coffee, especially if the inexpensive brand you're considering does not state the type of bean used. Another improvement is the method of freeze-drying which preserves more of the flavor than spray drying. So looking for brands that state their product is freeze-dried will also up your chances of getting a better quality instant coffee. Let's take a look at some of the best instant coffee brands. As was just mentioned, to make the best instant coffee you're better off looking for 100% Arabica instant coffee that has been freeze dried. So the instant coffee brands on this list fit those criteria. Here in no particular order are some of the best instant coffee brands, all are 100% Arabica instant coffee brands and are freeze dried. 1. Waka Coffee. This instant coffee is a Colombian coffee which has smooth citrus flavor notes. I love it as an iced coffee. They also send 4% of each sale to help bring clean water to developing nations. 2. Sudden Coffee. With Sudden Coffee you have a choice of a medium roast (with flavor notes like fresh melon and chocolate) and a light roast (with flavor notes like cantaloupe and ginger). They use single-origin beans and don't use any additives. 3. Mount Hagen. This quality instant coffee is fairtrade, organic and kosher certified. The flavor is described as rich, spicy, complex, slightly sweet and smooth. 4. Giraldo Farms. This is a 100% Colombian coffee which has an organic option and comes in regular and some flavor options (like vanilla, hazelnut) along with a decaf option. Did you recognize any of the brands on that list? Probably not, right? That's because they may not be that well known, and that may be another reason instant coffee has a bad reputation. The well-known brands may not taste as good because of the low-quality beans and inferior production process. Other brands may not be as pure, containing additives and flavors which may add to (or perhaps disguise) the flavor, but lack the quality. If I've missed any of the 100% Arabica instant coffee, freeze-dried brands please let me know in the comments at the end of this post. But I don't want you to think I'm against other instant coffee brands, I just think if you're after quality you might as well start from the top. If you're up for giving some other well-loved instant coffee brands a try here are a few more top rated brands (they may not be 100% Arabica or freeze-dried). 1. Jacob's Cronat Gold. Jacob's is a well-loved instant coffee brand and comes in two options, Jacob's Cronat Gold and Jacob's Kronung. The Cronat Gold is a lighter roast and is said to be a bit smoother than the Kronung and has flavor notes of chocolate, but both are a good option. 2. Starbucks Via Colombia. Starbucks Via instant coffee is a mix of a traditional instant coffee and micro-ground coffee. This mix is said to improve the flavor of their instant coffee. Via Columbia is a medium roast and has flavor notes of chocolate. 3. Douwe Egberts Pure Gold. This is a freeze dried, medium roast instant coffee with a mild smooth flavor. Hopefully, the brands in this section will have you well on your way to finding the best instant coffee for your flavor preferences. Many of the above instant coffee options come in glass containers. That's fine if you're making it at home but what about if you're talking about camping coffee? Not to worry, most of them are also available in single serving packets. Let's talk about a few options. 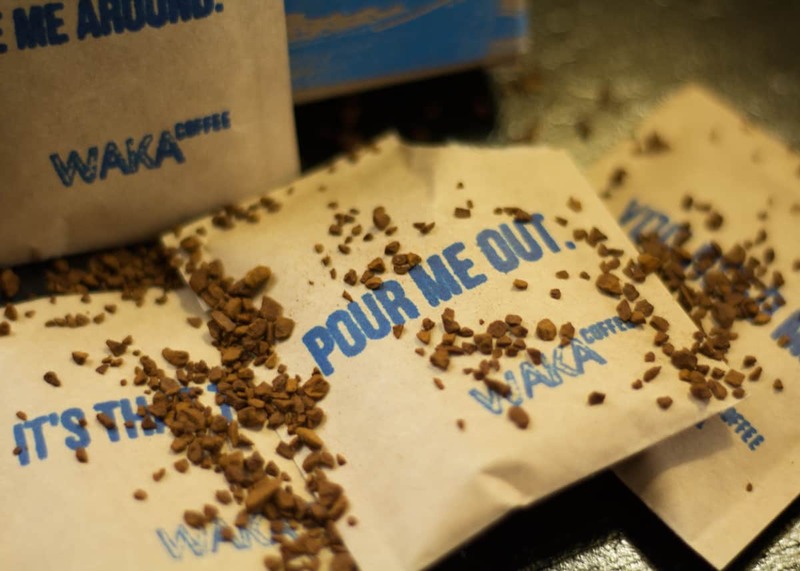 Taking instant coffee on your travels or camping trips can make packing and brewing coffee easier. You won't need as much gear, no coffee grinders, filters, brewing equipment… pretty much it's just the packets, a mug and a way to heat water. You can also make iced coffee from instant coffee easily while camping. Just mix one teaspoon of cool water into the instant coffee powder/crystals then add some cold water and ice. If you like your iced coffee sweet remember to take along some liquid sugar because regular sugar doesn't dissolve very well in cold water. The same rules we talked about earlier in this post hold true for the best instant coffee for camping, you'll want to look for 100% Arabica instant coffee that's freeze dried, so I'll start off with a few of those. Mount Hagen. Mount Hagen offers a box of 25 single serve packets. Waka Coffee. This instant coffee comes in boxes with 8 packets in each. Sudden Coffee. Sudden instant coffee comes in non PLA plastic tubes with an 8 (tubes) pack option and a 48 (tubes) boxed option. Starbucks Via Colombia would be another good instant coffee for camping because it comes in single servings. The box I've linked to has 50 servings so if you're camping as a family or with a group of friends this would do the trick. This is made with 100% Arabica beans and is a mix of instant and micro-ground coffee. Helpful tip: When taking instant coffee camping, it's best to ditch the box and bring as many serving packets as you need in a Ziploc bag to save on space. You're all set now, you know the best brands and easy to pack options so you can still get that instant kick-start while you're camping/traveling. But what if you just love the taste of coffee and can't handle the “kick”, yes I'm talking to all of you searching for the best instant decaf coffee. Not to worry, I haven't forgotten about that, I often reach for decaf in the evening because I'm craving that coffee flavor/comfort, but am not a fan of insomnia. So let's look at some decaf options. You're probably not going to be surprised to see some of the brands from the above lists on the decaf coffee list as well. It just stands to reason right? The best decaf options come from the best overall brands in the instant coffee game. When it comes to decaffeinated coffee it's best to avoid the kind that go under a harsh chemical process and stick with the brands that use a Swiss water (or similar) process. The ones mentioned below fit that bill. Mount Hagen Instant Decaf Coffee. This instant decaf is made from 100% Arabica beans and is freeze dried. It's also organic and fairtrade. They use carbon dioxide and pure water to decaffeinate the coffee, so no harsh chemicals here. Claims to be 99.9% caffeine free. Starbucks Via Instant Italian Roast Instant Decaf Coffee. This is a dark roast instant decaf made from 100% Arabica coffee. It's a mix of decaffeinated instant and microground coffee. This is one of the few Starbucks decaf options that uses the Swiss water process. While this is a decaf there are small amounts of caffeine present, possibly around 15 mg per 80z serving which isn't much when compared with 180 mg in a regular Starbucks 8oz, but could make a difference depending on how sensitive you are. Nescafe Taster's Choice House Blend Instant Decaf Coffee. This is a light to medium roast which undergoes a natural water process to remove the caffeine. Claims to be 99.7 % caffeine free. You may need to use 2 servings of this because of the small serving size. But if you drink your coffee in a fancy china teacup (I do sometimes) one might be fine. As with other decaf coffee there are small amounts of caffeine in instant decaf coffee (roughly 3-7 mg per 12oz) so if you have been avoiding coffee because of the hassle of brewing it and the caffeine content it might be good to try your instant decaf cautiously (away from bedtime) if you're really sensitive to caffeine. Now that we've looked at some of the best brands, let's take a look at some instant coffee brewing tips. To brew up some great instant coffee there are a few little things you can do that should improve the flavor. Along with the following suggestions storing your coffee properly can help keep it tasting its best. Use fresh filtered water. Every great cup of coffee starts with pure, filtered water. By using good quality water you reduce the possibility of adding weird chemical and/or other flavors to your cup. And use fresh water not the stuff that's been left over in your kettle. Mix one teaspoon of cool filtered water into the instant coffee powder/crystals. This allows it to dissolve more gently and makes for a better tasting cup. Measure out a rounded teaspoon of instant coffee to 8 ounces of water (unless otherwise instructed on the product). Once you taste the mix you can adjust by adding more instant coffee, or more water depending on your preference. It also helps to use the same sized cup/mug until you figure out your instant coffee to water ratio. Let your water cool. 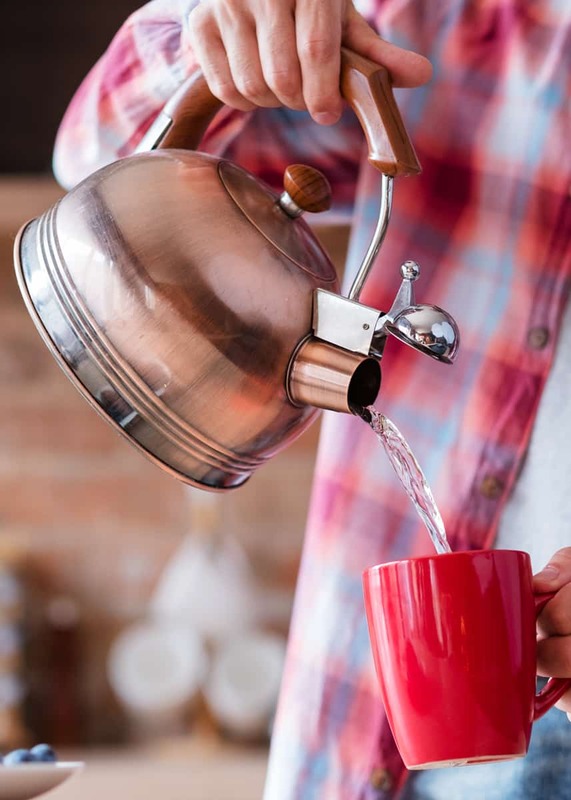 Once your water comes to a boil let it cool for a minute or two before pouring it over your instant coffee mix, this will avoid any possibility of weird flavors resulting from scorching the brewed coffee concentrate. Burnt coffee never tastes good. Flavor to taste. Taste and if needed add milk, cream, sugar, maple syrup (my favorite), honey, cinnamon, coco, a little vanilla extract or whatever else you think might boost the flavor. Take it to the next level and froth your milk first. Add a rounded teaspoon of hot-chocolate mix. This is a go to favorite of mine, it will give you a mocha type drink which always goes down good. Try hot milk. You could also use hot milk in place of hot water for a creamier result. Try iced coffee. Change things up some more by using cold filtered water and ice in place of the hot water (remember to mix the crystals with a tsp of cool water first). Instant coffee makes a great, easy iced coffee. You may even prefer it that way. I hope this post will help you find the best instant coffee out there. I'm glad I didn't give up on instant. In the past, I tried a few different kinds and wasn't a fan, but recently I've noticed a difference. That's not to say I'll be making a full change to instant, I'm a big fan of grinding my own coffee and enjoy the flavor of a good pour-over, or Moka pot brew in the morning. But when I'm in a hurry or want a fast iced coffee I'll be reaching for the 100% Arabica freeze dried instant coffee. I'll probably also pack some on my next camping trip. Do you think you'll give instant a try, or will you be switching up your brand for one mentioned on my list? If so I would love to hear about it, please let me know by joining me in the comments. Dena Haines is co-editor of EnjoyJava! - and is working to make it the best coffee blog in the world. Ambitious, right? She is a travel blogger and content marketer. She is also co-founder of GudGear (an outdoor adventure blog) and Storyteller Media (content marketing for travel brands). Work with Bryan and Dena.